A tea plantation in northern Thailand. A bed and breakfast just this side of the Thai-Burma border. A medical clinic in East Timor. A French-bred prince returning to his motherland. 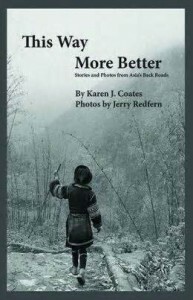 Karen Coates writes about these and other stories way off-the-beaten path in her riveting collection, This Way More Better: Stories and Photos from Asia’s Back Roads (ThingsAsian Press, 2013). To complement these essays, her photographer husband, Jerry Redfern, has taken stunning shots all around Asia. In fact, Coates and Redfern explore 11 countries over 12 years: Cambodia, Laos, Thailand, Tibet, East Timor, Malaysia, Indonesia, India, Sri Lanka, Myanmar, and Vietnam, the starting and ending points of the book. Together the stories and photos make for a haunting look at countries either plagued by war or struggling to remain intact while the world around them crumbles. Many of the pieces have a Heart of Darkness quality to them as they depict outsiders who either came to Asia years ago and have settled into rural areas, or other non-native peoples who have adapted to new environments. Most of the places in this book are ones even old travelers like myself have never heard of: Sapa, Vietnam; Dili, East Timor; Plain of Jars, Laos. I particularly enjoyed this book because of the beautiful writing, but also because the authors journey to a part of the world I, too, can’t seem to get enough of. The books you feature are always so fascinating, Susan. I think we must have similar tastes. 😉 I’ve never been disappointed with a book you’ve recommended. Must check this one out! Wow, thank you so much, Amy! I’m so touched. I can’t wait to review yours!